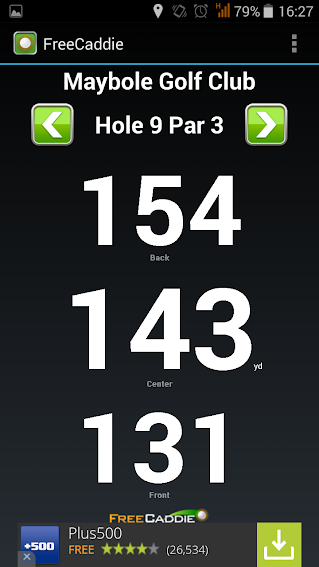 As I said yesterday, I have decided to try out some of the most popular Android golf apps and write up my findings. Today was the turn of FreeCaddie – the free version. You can install either the completely free version of FreeCaddie or pay £2.37 (at the time of writing) to get the “pro” version with an extended range of options. Hopefully I will revisit and try out the paid version at some point. FreeCaddie is a pretty small download from Play Store – just a MB or two. This is just the core app date though – you will download more as you add courses to it. The first thing to do when you install it is to get some course data in there. When you run the app it will try to use your phone’s GPS to ascertain your location. If you are inside you can go into the settings menu and override the GPS by manually putting in your location. The app then comes up with a list of courses in the vicinity (I’m not sure the radius of the catchment but judging by the list I got I would say it must be 30 miles or so). The list seems pretty extensive but is not exhaustive – I found an omission which actually happened to be the course I intended to play today, Maybole. It has obviously been overlooked by local golfers – one of the cool things I found about FreeCaddie that anyone can create course data, in fact I was told by the support team that they prefer local golfers who “know the course well” to create/ edit the course data. So, I created an account at freecaddie.com and logged in to input the data for Maybole Golf Course. I had a couple of issues getting started with the course editor (it wouldn’t launch in my browser for some reason but I got round that by using a different one) but the support team were extremely helpful. They responded to my email in less than a day with the resolution to my problem. I was really impressed by the support provided – especially considering I was using the free version and haven’t paid them a penny (yet). It was then a case of using Google Maps to identify the various greens of the course, clicking on front, centre and rear for each hole. This is extremely straightforward and it took me a matter of minutes to input the nine holes at Maybole. As soon as I submitted the information Maybole appeared on my list of courses in the phone app and was available to download. When I first installed the app I downloaded the data for the various local courses that I would be likely to play – I did this on WiFi in the house to avoid using data as my phone package is not generous… The great thing is then that you don’t need a data connection when at the course – of course you need a GPS signal but that’s all. I can imagine there must be remotely located courses where you can’t even get a mobile signal so to me this feature is very much a plus point. So, with the course data created, inputted on to the FreeCaddie course database and safely downloaded to my phone’s app, it was off to the course to try it out. Not bad at all! There are no markers on the course itself so it was slightly difficult to tell just how accurate the readings were but I did walk to the middle of a few greens and I think the distances FreeCaddie gave me were within a few yards at the most. I have played Maybole before so even though there a number of blind holes, I knew where I was going. It was however rather useful to have an accurate range to the green for these shots when choosing club. It was so windy today that it didn’t make a huge difference to my game but I could see that in better conditions – and when I was hitting more consistently – the benefit of knowing how far the flag was would be a very useful one. The distance screen above is what you see all the time with FreeCaddie – in the free, no frills version anyway – but for me it is pretty much all I want from a rangefinder. Other apps I have used have had far more information onscreen, typically using Google Maps imagery to show the current hole but, as noted, I didn’t really need this at a familiar course. On the 8th I hit a pretty poor tee shot and was left with a longish approach shot (it’s a short par 4 so you should really be looking for a wee chip on after a decent tee shot). I went for the 7 iron then decided to double check with FreeCaddie. The yardage it indicated was more appropriate for an 8 for me so that is what I hit. I hit the ball cleanly and reasonably on target. The ball trickled off the side of the green but came to a halt almost exactly in line with the flag so the length was spot on. Had I hit the 7 iron as I had been inclined I would have been right off the back of the green! The GPS lock on FreeCaddie seems really good. After it initially locks on when you start playing, it keeps locked on so everytime you pull your phone out, the yardage is accurate. This is exactly what you want. When I played using Hole 19 Golf recently, I was getting quite frustrated with the lag to relock at every shot. One other thing that impressed with FreeCaddie was its (lack of) battery use. OK, I only played nine holes today but doing so only took about 10% of my battery. I didn’t turn off my data connection so if you did that it would be even less I presume. This is in stark contrast to other apps I have used when I have had to be extremely vigilant to have a fully charged battery in order to get all the way round with the phone dying! As noted, FreeCaddie is a rangefinder – a very good one but that is all. No scorecard or bells and whistles. I believe that is a function available with the paid for pro version. It didn’t bother me greatly, I just used a note function to input my score on my phone but I guess it would have been nice as usually I would use the same app for yardage and keeping score. Is it enough to make me pay for the pro version? Not right now but possibly if I settle down to using FreeCaddie as my full time rangefinder app I will want to have integrated scorecards. There are other functions in the pro version such as course mapping and you lose the ads so for the price it is a pretty good deal. The thing that really piques my interest with FreeCaddie is its smartwatch support. It currently supports Sony Smartwatch 2 and the Pebble but according to the team they are working on adding Android Wear support this year. The Pebble doesn’t really appeal to me but I have seen the Sony watch on Ebay for in the region of £50, If I could pick one up at that sort of price it would be a serious consideration – especially considering the course I will be caddying at soon prohibits the use of mobile phones on the course. The free version of FreeCaddie is an excellent rangefinder indeed and if that is all you want I have no hesitation recommending it. I am going to try out a range of other apps to compare so I will reserve judgement as to whether it is the best IMO for a later day. This entry was posted in App and tagged Apps. Bookmark the permalink.